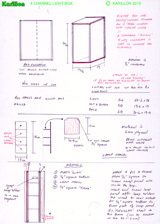 The plans shown are some drawn up by me in about 1972. Each box holds 4 lamps (bc or es), in 4 colours and of 25w rating. Originally these were golf ball bulbs hand coloured using bulb laquer. Covering the lamps is a plastic screen cut from a sheet of perspex. This is patterned and is available as a replacement for glass from diy stores. If you use higher wattage lamps you MUST not use the perspex cover, or arrange ventilation of each lamp section. The perspex is fixed using a few screws to a wood frame of 1/2" square timber. The finished box should be covered and corner protected, and fitted with a handle for transport. If you make two as suggested, they may be clipped together using clasps and lift off hinges. Make sure all wiring cable is rated correctly and connected to the correct bulgin 8way pins. (standard wiring can be found on the internet at many sites). clicking this image will open a full size image (pdf)in a new window. Right click & save as to get your own full size copy in pdf format. This project is to be considered as a guide and electrical parts require a qualified person to check before use. Do NOT operate with power when the perspex cover is removed, as live electrical connections may be accessible (if for example a bulb is removed).